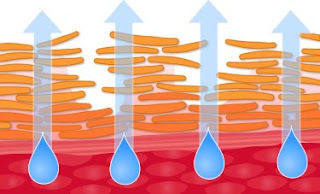 dysfunctional barrier cannot hold the proper amount of water and allows moisture to evaporate from the skin. If the hydration levels are not increased in the skin, the depletion of water causes a reduction in the cohesiveness between corneocytes, the cells that make up the stratum corneum. 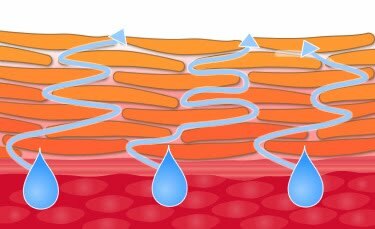 As a result, the corners of the corneocytes turn up and eventually will scale and flake - commonly known as dry skin. The skin then becomes dry and brittle. Rough surfaces do not refract light as clearly and the healthy glow from the microcirculation is hidden by the accumulation of corneocytes. Aging skin shows an increase in dehydration and a slower recovery from damage to the skin’s surface. Cosmeceutical moisturizers like the new glotherapeutics Moisturize and Restore collection address dry skin symptoms by raising hydration levels in the stratum corneum and by acting as a natural barrier to keep the nutrients in the skin. Essential fatty acids, ceramides, emollients and humectants will reverse the negative effects of dry skin by restoring elasticity, leaving the skin smooth and velvety soft. Visit www.gloskincare.com to learn more about barrier protection provided by glotherapeutics moisturizers!